Except where unpackaged food is concerned, the Amp Miser™ 2.0 series is ideal for virtually any unit goods applications. 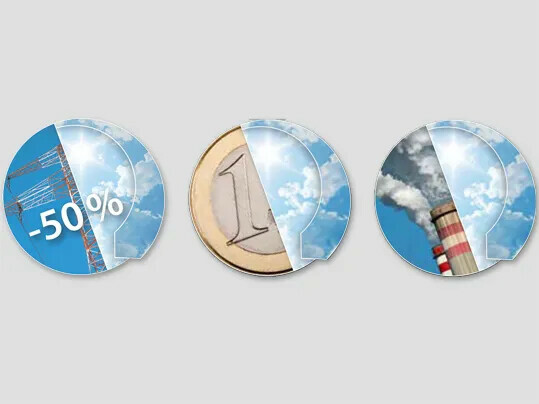 Further advantages are the resistance to chemical influences like kerosene vapours and the reduction of CO2 emissions due to lower energy consumption. Our energy-saving Amp Miser™ belts have an excellent track record under the tough conditions in logistics centres and on baggage conveyors*. The new Amp Miser™ 2.0 generation with enhanced tension members and new Texglide™ technology now produces even lower coefficients of friction between the underside of the belt and slider bed – even when slider beds are galvanised. No other changes to the conveyor are required. μ < 0.17. And it’s just μ < 0.13 on nongalvanised steel. Compared with standard types, in typical applications with long conveyors and heavy loads, up to 50 % energy savings are possible, now. The quality, design and condition of all other mechanical and electrical components also play a major role in energy consumption as a whole. Small drives for example are usually not very efficient because a lot of the energy is required to drive the conveyor’s moveable parts alone. 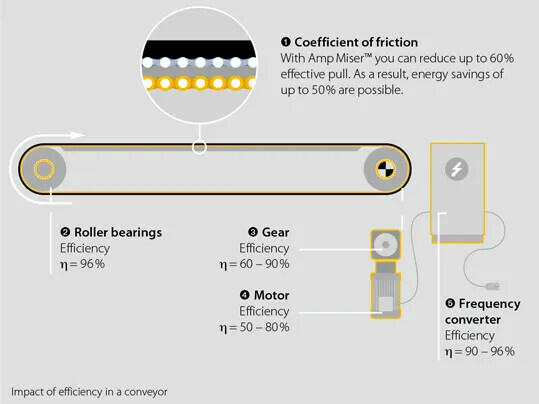 Even with a low coefficient of friction, by using Amp Miser™ 2.0 conveyor belts you can save up to 50 % of the conveyor’s energy costs. 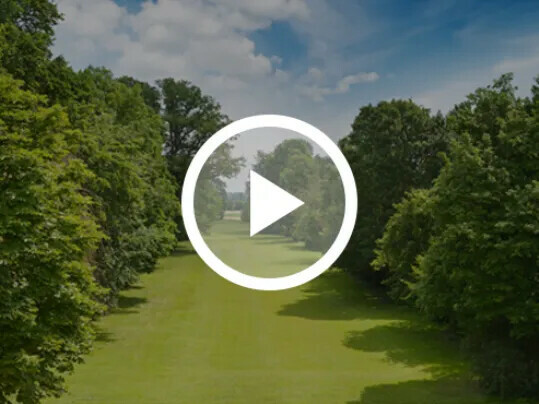 Fulfils top demands on equal thickness. Very flexible splice. Standard splice for double-layer belt types. For quick fitting and removal of the belt without dismantling parts of the conveyor. *2 Minimum drum diameter was determined at room temperature and does not apply to conveyor belts with mechanical fasteners. Lower temperatures require larger drum diameters. What does Amp Miser™ mean? Amp Miser™ is an abbreviation of “Ampere Miser”. The name emphasises that installing an Amp Miser™ belt saves energy and improves your eco footprint as a whole. Our Amp Miser™ products are patented in Europe and the US. Patents have been submitted in many other countries too. What does Texglide™ (TXGD) mean? 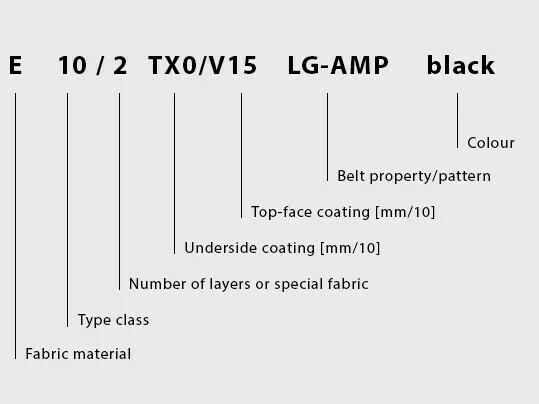 Texglide™ (TXGD) is a compound embedded in the underside of the fabric. 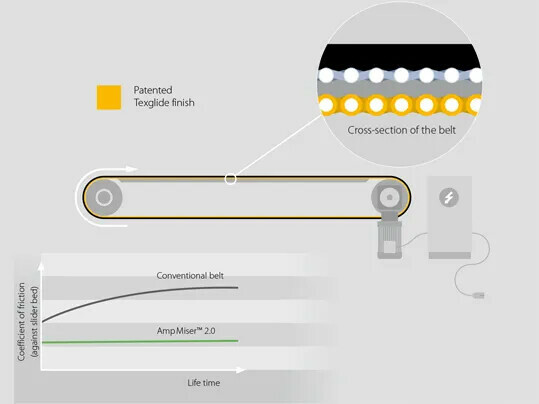 Texglide™ isn’t just an add-on, or a coating, but a permanent feature of the bottom of the fabric throughout the belt‘s life cycle. Texglide™ guarantees low friction between the belt and the slider bed. What material is recommended for slider beds? Amp Miser™ belts can be used on slider beds of all types (such as wood, steel or galvanised steel). 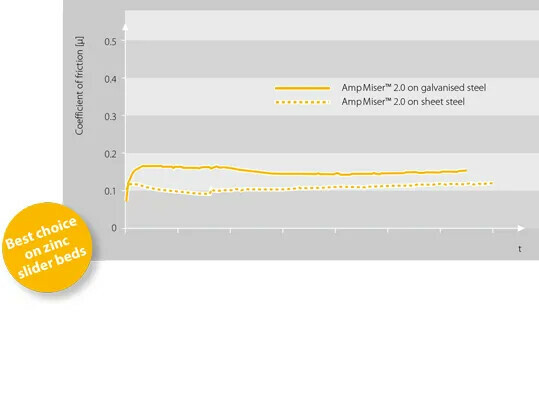 In the case of galvanized steel, the new Amp Miser™ 2.0 types cut the coefficient of friction to under 0.17, as regards steel to 0.13 and to less than 0.06 in plywood. What problems arise on galvanised slider beds? There are zinc coatings on the market that exhibit the same behaviour as normal steel. Others are soft and produce zinc dust when abrasion occurs. This leads to black deposits on the bottom of the belt and a steep rise in coefficients of friction in standard belts. Can Amp Miser™ belts be used on any type of conveyor? Yes, but they’re not appropriate on every conveyor. On short conveyors (< 2 metres) the effect is negligible. The motor requires more energy for itself and the drive than for the load. If the belt has rolling support and doesn‘t operate over a slider bed, the coefficient of friction is low anyway. Amp Miser™ has no impact. 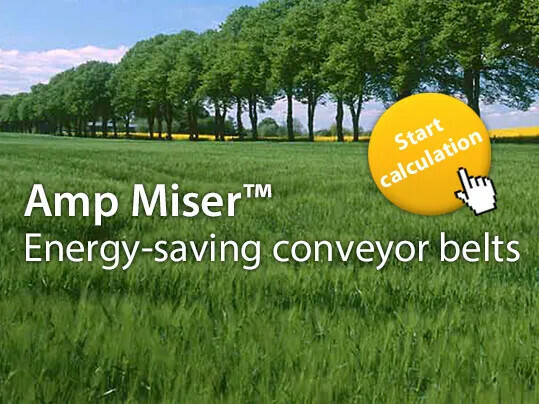 In the case of inclined conveying, Amp Miser™ only achieves energy savings when the type of conveying is horizontal. Vertically there’s no impact on the coefficient of friction. The same goes for acceleration. Acceleration and coefficients of friction don’t depend on one another. Amp Miser™ doesn’t require you to adapt the conveyor. Just fit the belt and you can start saving immediately. What are the best arguments in favour of fitting Amp Miser™? End users reap the biggest benefits from installing Amp Miser™ belts. They operate their conveyors for many years and directly and sustainably save energy and running costs. high-quality belts with significant added value are used for the same price as standard belts. Low coefficients of friction against slider beds are good. But what happens in the drive drum? Drive power always depends on the effective pull that the motor has to transmit. Fu = m x g x μ (mass x acceleration of gravity x coefficient of friction). We can’t influence mass and acceleration of gravity Reducing the coefficient of friction by 60 % on a steel slider bed also decreases the effective pull Fu by 60 %. When elongation at fitting is the same, the grip on the drive drum is sufficient to ensure the belt is driven without creep. No changes are required on the conveyor. How do I measure energy savings? A proper comparative measurement can only be made by looking at consumption with a traditional electricity meter (effective efficiency in the three phases). 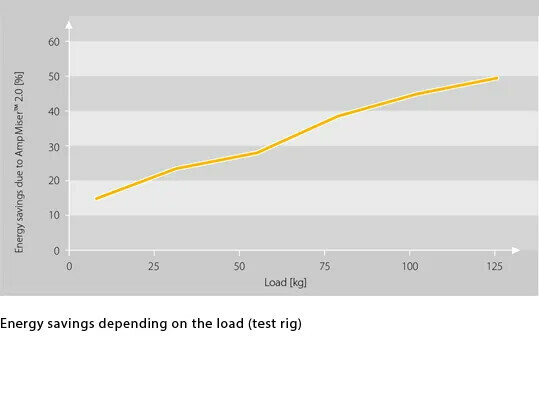 All Forbo Siegling measurement results are based on this method. 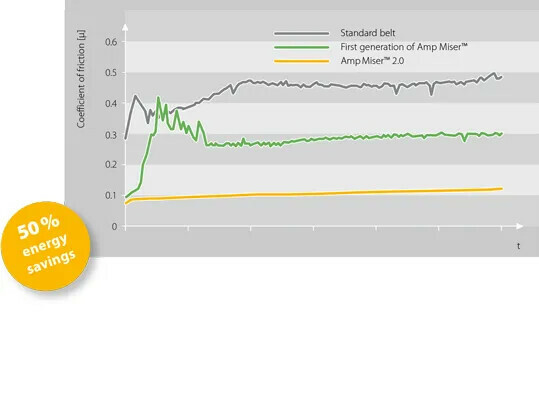 Do Amp Miser™ 2.0 belts costs more than conventional ones? There are no extra costs compared with conventional belts. 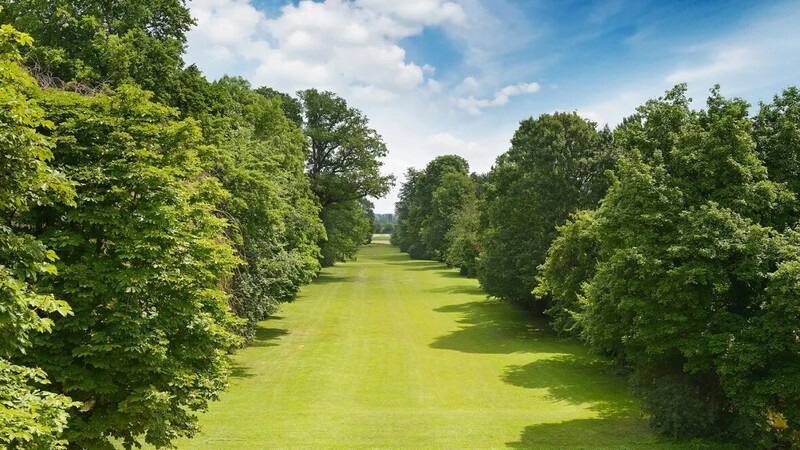 In typical applications the energy savings mean that the belt has paid for itself after less than three years already.